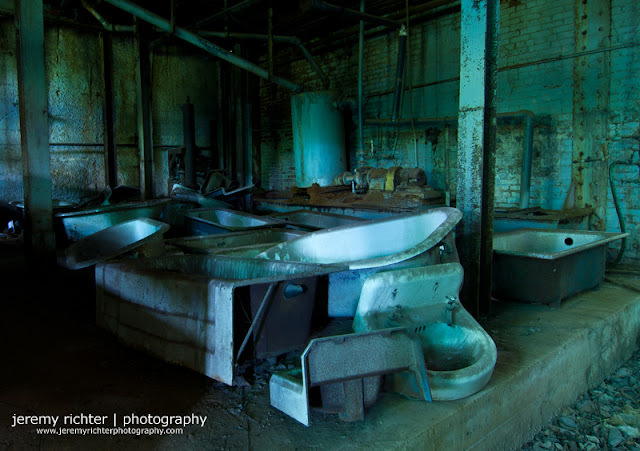 In one of the buildings at the Republic Steel, East Thomas Plant in Birmingham, there is a room filled with all sorts of tubs: sinks, toilets, large basins, bath tubs. It's hard to say what purpose there was in lodging all of this accumulated tubbery in this particular locale, because it's entirely out of sorts with the contents of not only the adjacent rooms but also the rest of the building. Not to mention, the eerie cast levied by the green-hued windows.